Last year, I did a review of one of the EatSmart food scales. I really like it and emailed the company again about doing a review of one of their bathroom scales. I got the Precision Premium Bathroom Scale to review. I really like some of the features. Right when you step on, the scale reads your weight. You don't have to turn on a button. The display is big and easy to read. Also, the scale is small enough to store in the corner of your bathroom without taking up too much room. The scale is on sale now for $32.95. As a nutritionist, I believe that it is important to keep your weight in balance. I weigh myself about once a week to make sure that I stay about the same weight. 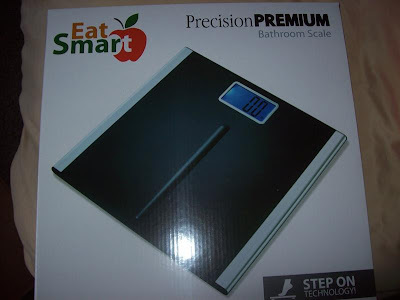 The giveaway will be for this EatSmart Bathroom Scale that I reviewed. The giveaway is open until Midnight on Tuesday March 15th. Winner will be chosen on Wednesday March 16th using Random.org. The winner will have 48 hours to respond or a new winner will be chosen. Visit the EatSmart website and let me know which scale that you are most interested in. I like the Eat Smart Precision Pro Kitchen Scale. I love the digital nutrition scale! That would be so helpful!! I like the EatSmart™ Digital Nutrition Scale - Professional Food and Nutrient Calculator. I am most interested in the EatSmart Precision GoFit Digital Body Fat Scale w/400 lb Capacity & Augo Recognition Technology. I could use their EatSmart Precision Voyager Digital Luggage Scale w/ 110 lb. Capacity & SmartGrip. I would like the Quick View EatSmart™ Precision Premium Digital Bathroom Scale with 3.5" LCD. I would like to have the EatSmart Precision Pro - Multifunction Digital Kitchen Scale w/ Extra Large LCD and 11 Lb. Capacity! I entered your Vibrant Fitwear giveaway! I like the EatSmart Precision GoFit Digital Body Fat Scale w/ 400 lb. Capacity & Auto Recognition Technology. I really want the bathroom scale, but the food scale or the luggage scale would be nice to have as well. I like the Digital Kitchen Scale. I liked the EatSmart Precision GoFit Digital Body Fat Scale. I like EatSmart™ Precision Pro Digital Kitchen Scale. I'd love the EatSmart™ Digital Nutrition Scale - Professional Food and Nutrient Calculator! I like the red EatSmart Precision Retro Mechnical Kitchen Scale w/ 11 lb. Capacity and Oversized Dial. I like the eat smart precision pro kitchen scale. rayreadbatyahoodotcom. I like th EatSmart™ Precision Digital Bathroom Scale. I "like" you on Facebook as Tina Valenti. i like the digital nutrition one! I really like the silver EatSmart Digital bathroom scale. Its sleek and simple looking! I entered the Dali Decal giveaway! I like the Eat Smart GO Fit Scale. I entered the Tavern Direct giveaway. The luggage scale is so cool! My favorite is the Eat Smart Precision Pro Kitchen Scale. I would love to have the EatSmart Digital Nutrition Scale - Professional Food and Nutrient Calculator. I hope this doesn't get me disqualified, but I like the one you're giving away the best, the EatSmart™ Precision Premium Digital Bathroom Scale with 3.5" LCD and "Step-On" Technology. I don't like the ones with the large platforms because I have a very small bathroom without much floor space. The GoFit Digital Body Scale looks really nice too. I like the GoFit Digital Body Scale! I would love their EatSmart Digital Nutrition Scale - Professional Food and Nutrient Calculator! I like the EatSmart Precision Retro Mechnical Kitchen Scale in red. I like the EatSmart Precision Voyager Luggage Scale. I'd love the digital precision scale. I entered the Tavern Direct Give-away. Eat Smart Precision Pro Kitchen Scale. Tavern Direct Trio Giveaway ! $25 Dali Decals Gift Certificate giveaway! I like the Oversized Platform the most But would love this scale because i am pushing my self to loose over 100 pounds. and this will be good to have instead of always going into my doctors office on Wednesdays just to weigh my self. I would love the Eat Smart Precision Scale! I love the digital nutrition scale.